Tangier is not your run-of-the-mill beach vacation destination. But as Virginia's only occupied Chesapeake Bay island, we thought it ought to be included here. Tangier is a neat place to visit, but you should know that it's a low-lying island surrounded by marshland that's occupied by a bunch of hard-working watermen and their families. You won't find people sunning themselves on sandy beaches here. Tangier sits right out in the middle of the Chesapeake. There are no roads to the island - most people get their by boat, although they also have a landing strip for planes. There is a marina where you can dock your boat if you travel out there on your own or you can take one of the ferries from Reedville VA, Onancock VA or Crisfield MD. Many people just take the ferry out and back to Tangier. There's enough time between arrivals and departures to explore the small island. Plan on enjoying some fresh seafood while you're out there. There are a couple bed and breakfasts if you'd like to spend the night. 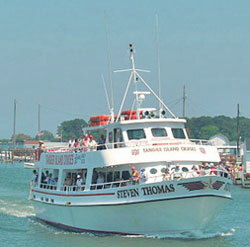 The ferries to Tangier Island leave from Crisfield Maryland, Reedville Virginia and Onancock Virginia. 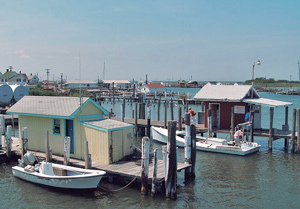 Each of these small waterfront towns are good home bases for exploring the Chesapeake Bay area.